What creative tool has been going strong for a whopping 70 years, has helped to record classics in every genre of popular music, and is arguably more beloved today than ever before? That would be the glorious Gibson P-90 pickup! In line with its long history of innovation, Gibson has always designed and manufactured its own pickups, many of which have become legendary. In the early, pre-War years of the electric guitar, the company first offered the blade pickup of the 1930s that would become known as the “Charlie Christian pickup” for its prominent use by the iconic jazz guitarist of that name, then several iterations of designs that evolved toward what we now know as the most revered fat-single-coil pickup of all time. Once Gibson production had ramped up again after WWII, the design took recognizable shape in 1946, and in ’47 it went into regular production as the P-90 we know and love today. Used by jazz and country artists in the late ’40s and ’50s; seminal blues, rock’n’roller and rockabilly guitarists in the ’50s and ’60s; and full-on rockers and heavy-metal guitar gods in the ’60s and ’70s—and every conceivable breed of electric player ever since—the P-90 is incredibly versatile for a piece of tech developed when the price of gas was $0.15 a gallon and Frankie Laine, Duke Ellington, and Frank Sinatra were the country’s most popular artists. The P-90 really came into its own, however, in the 1950s and early ’60s. It was standard equipment on the first Les Pauls, the “Goldtop” models of ’52-’56, and from the mid-’50s through most of the following decades continued to power the popular Les Paul and SG Junior and Special models that many rock, blues and punk players have wielded with such force. Why have P-90 pickups endured when virtually everything else about the way popular music is made has changed? The simple: they just sound great! The P-90 boasts a slew of sonic traits that make it extremely appealing, along with an individual character that helps any player stand out in the mix. The P-90 has a rich voice, with decent balance across the frequency range and good depth in the right guitar, but it’s also particularly juicy in the midrange frequencies in which the guitar lives and breathes—helping you to cut through the clutter—while refraining from being overly woofy in the lows, or in any way harsh or spikey in the highs (the way many narrower single-coil pickups can be). In addition, a genuine Gibson P-90 presents some grit, snarl, and granularity amid all the sweetness, all of which help it to be a superb blues and rock’n’roll pickup. Into a clean amp it can gurgle and purr with mellow beauty; into a cranked amp it can roar, growl and scream with a savage rawness that will express the basest rock urges. Whether you find it under a “soapbar” or “dogear” cover, the construction of a P-90 is essentially the same. The wide coil is wound with approximately 10,000 turns of 42-AWG wire. There are two Alnico bar magnets beneath the bobbin, placed either side of a steel bar that the six individual threaded steel pole pieces pass through, to which it transfers the magnetism from the bar magnets. As a single-coil pickup, the P-90 exhibits good clarity and a well-defined high end, but its wide construction presents a broader “magnetic window” than many narrower single coils, which contributes to that characteristically warm, thick Gibson tone. While we often think of single-coil pickups as being “less powerful” than humbuckers, the typical P-90 will drive an amp about as hard as a traditional humbucker. 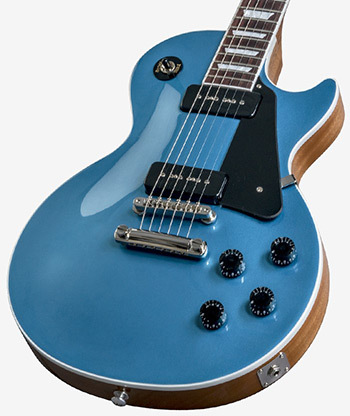 The P-90’s single wide coil carries approximately the same amount of wire as is split between the PAF-style humbucker’s two coils, and these two different types of classic Gibson pickups exhibit DC resistance readings that are generally within the same range, about 7.5k to 8.5k ohms. We continue to manufacturer our own P-90 pickups to the same materials and specs as the most beloved examples of the ’50s and ’60s, and they are standard equipment on many popular 2018 models. 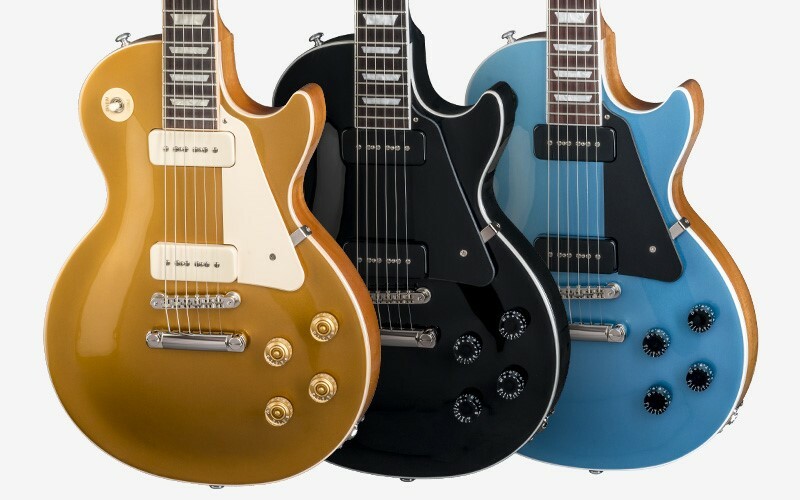 From Gibson USA, both the 2018 Les Paul Classic and 2018 Firebird Studio carry a pair of P-90 pickups, and the 2018 ES-330 from Gibson Memphis is loaded with their Memphis Historic Spec (MHS) P-90s which are based on historic, underwound examples for certified golden-age tone which perfectly compliment this model. Several models from Gibson Custom also carry this distinctive single-coil, according to the original guitars they are based on.